Samsung announced Wednesday that they will soon be releasing an updated Reader's Hub. it will first be released with the net update for the Samsung Galaxy Tab 8.9 LTE, with the Galaxy Tab 8.9 Wifi and Galaxy Tab 10 to get the new app soon after. I believe this only affects the Japanese market, but according to old press releases the Reader's Hub is also shipped with tablets in the US market. 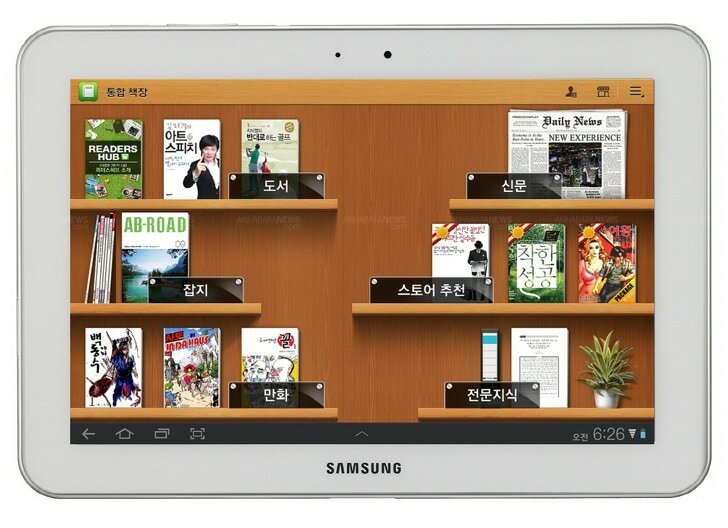 The Reader's Hub is what Samsung is calling their on-tablet bookshelf.and ebookstore. As you can see at right, it offers access to a digital library – from classical literature to the latest bestsellers and reference material. Samsung says that RH makes it "easy to enjoy reading all of the newspapers, magazines and books" within only one galaxy tablet. The update is mentioned as having new support for enhanced content, including embedded audio and video. I'm still looking into this. I've heard several of the major tablet makers have portal apps like this. Asus, for example, has [email protected] But does anyone really use these apps? I have video music, and ebooks on my tablets, but I always use my preferred viewing apps to manage the content. I've never really understood the purpose of a portal app; I already have one. It's the home screen of what ever tablet I'm using.